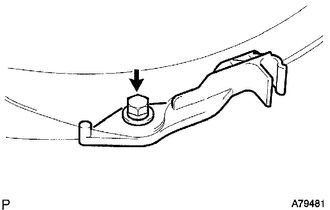 (a) Remove the propeller with center bearing shaft assembly (See page ). (a) Remove the bolt, 2 nuts and front floor brace LH. 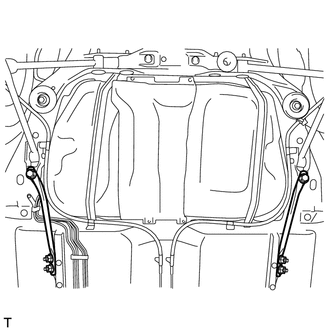 (a) Remove the bolt, 2 nuts and front floor brace RH. 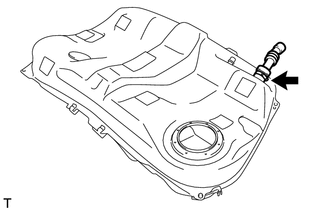 (a) Remove the 4 bolts and fuel tank protector sub-assembly. (a) Remove the set bolt and set nut of the No. 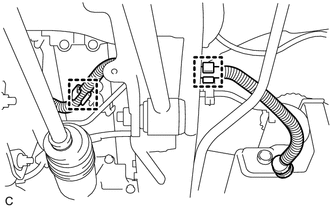 2 parking brake cable assembly. (a) Remove the set bolt and set nut of the No. 3 parking brake cable assembly. 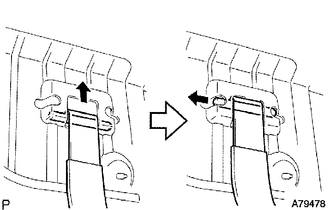 (1) Pinch the tabs of the retainer to release the lock claws and pull it down as shown in the illustration. (2) Pull out the fuel tank main tube. Check that there is no dirt or other foreign objects around the connector before this operation and clean the connector as necessary. It is necessary to prevent mud or dirt from entering the connector. 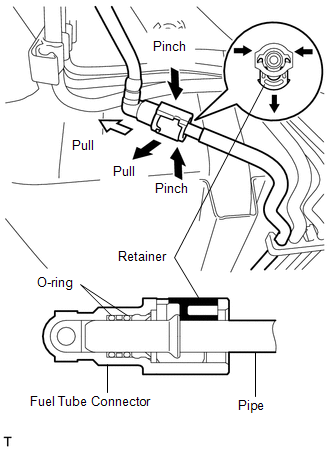 If mud or dirt gets in the connector, the O-rings may not seal properly. Do not use any tools in this operation. Do not bend, kink or twist the nylon tube. Protect the connector by covering it with a plastic bag. When the pipe and connector are stuck, push and pull on them to release them. (b) Disconnect the fuel tank vent hose sub-assembly from the charcoal canister assembly. Remove any dirt or foreign matter on the tube connector before performing this work. Do not allow any scratches or foreign matter to get on the parts when disconnecting them as the tube connector has an O-ring that seals the pipe. 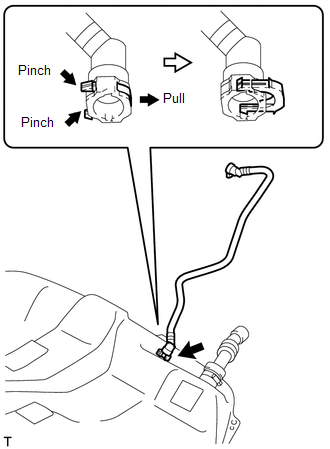 Do not forcibly bend, twist or turn the fuel tank vent hose sub-assembly. 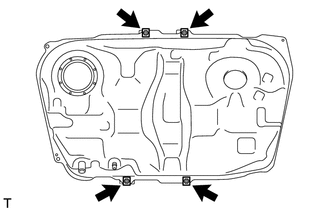 Protect the disconnected parts by covering them with plastic bags after disconnecting the fuel tank vent hose sub-assembly. If the tube connector and pipe are stuck, push and pull on them to release. 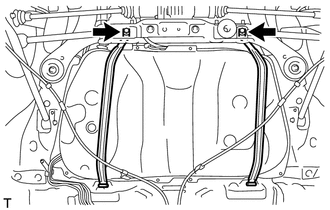 (c) Disengage the 2 clamps and separate the fuel tank vent hose sub-assembly. 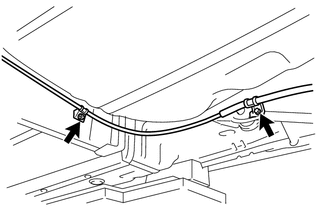 (d) Set up an engine lifter underneath the fuel tank. 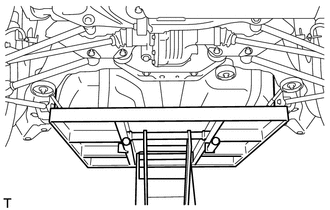 (e) Remove the 2 set bolts of the fuel tank bands. (f) Remove the hose clamp and disconnect the fuel tank to filter pipe hose. (g) Remove the fuel tank. 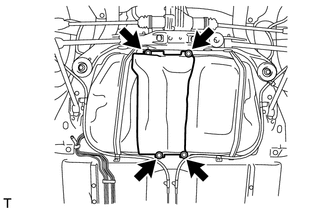 (h) Remove the 2 pins and 2 fuel tank bands as shown in the illustration. (i) Remove the 4 clip nuts. 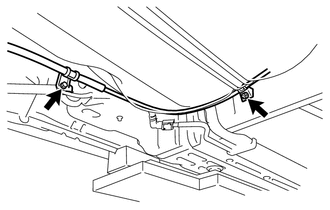 (a) Remove the fuel tank vent hose sub-assembly from the fuel tank. 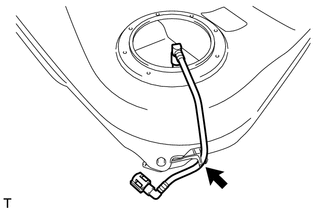 (a) Loosen the hose clamp bolt and remove the fuel tank to filler pipe hose from the fuel tank assembly. (a) Remove the fuel tank main tube from the fuel main tube support. 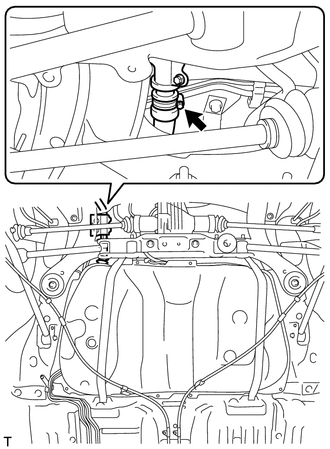 (a) Remove the bolt and the fuel main tube support. (a) Remove the 8 No. 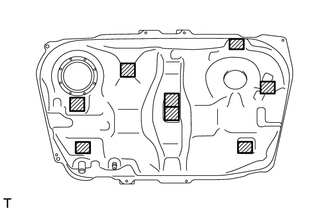 1 fuel tank cushions.